I suppose I COULD figure out how much soil, mulch or fertilizer I need for a garden section but…why? Sixth grade math retrieval can take too long. It’s easier to go to www.kelloggarden.com and click on their lawn and flowerbed soil calculator. It takes about 3 seconds. The calculator is especially helpful for raised beds. Is it worth spending more money on stainless steel garden tools? Mud slides off stainless steel so it definitely pays to shell out extra for digging forks, shovels and spades. Buy a good one and you only have to buy one, not one a year. Tools like weeders that are used more often can be made of high carbon steel. Carbon steel holds its edge longer and is easier to sharpen. Pruning saws? Replaceable blade saws are the way to go. 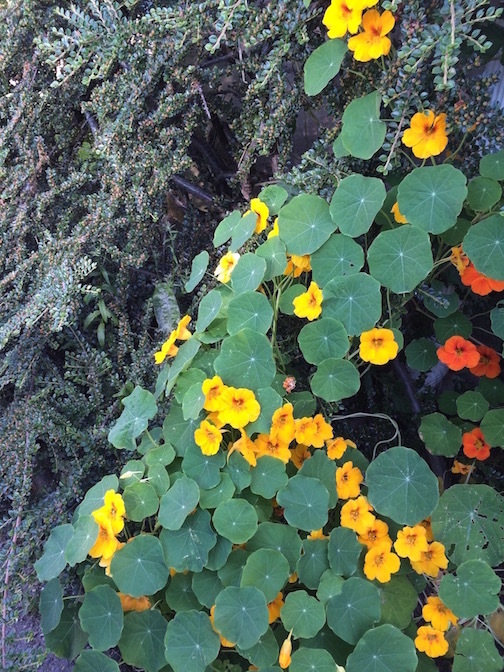 When first grade teachers want to show their kids the miracle of the seed, they choose nasturtiums. Nasturtiums are just about perfect. They come up fast; they grow like crazy and cover a large area in no time. They’re bright and cheery in all the colors of fire…the yellows, oranges and reds. You can get them to climb or crawl or spill. You can cut them, bring them inside and turn a small bowl into a work of art. As long as they are grown without pesticides you can eat them. The flowers add color and a peppery/sweet to salads and pasta and even desserts. Those first grade teachers know stuff. Besides nostalgia, planting heirloom seeds serves a real purpose. Heirloom seeds come from plants whose progeny have been around for at least 50 years. They are open-pollinated (not manipulated by man). Heirloom vegetables, flowers and herbs are a direct line to garden history; a history that didn’t commonly include chemical pesticides. Horticultural survival of the fittest. Heirloom seeds are purebred like poodles and golden retrievers. You MOSTLY know what you’re going to get even though they might vary a little in behavior.